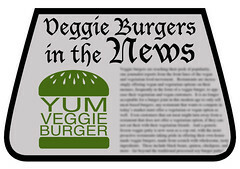 Yum Veggie Burger: Veggie Burgers In The News: Hi-Tech Veggie Burger? Veggie Burgers In The News: Hi-Tech Veggie Burger? And sodium caseinate? I had to google that to find out what it was, but as I suspected, it's a dairy product (the scientific name for casein). If you're going through all this trouble to make a "hi-tech" veggie burger, can't you find a way to make it vegan? The sliced patties don't even look appetizing at all - maybe after they are fried up, but that interim step where they looked like rubber just really turned me off. But maybe a more creative chef could come up with a better veggie burger made in a sous-vide cooker... What do you think? Well, I think the title sort of says it all, it's a burger to convert meat eaters, I like that idea, really, but I havent eaten meat in twenty years, and I actually like veggie burgers that do not try so hard to be exactly like meat. In the Netherlands we have the "vegetarian butcher" a lot of people love that stuff, but I think it's rubbery and not very tasty, it only tastes good with a ton of spices. This thing seems to be more about texture than taste too, and I'm fine with a softer burger that tastes great. But off course I haven't tasted it, so maybe it's really good, even though it looks a bit like spam.